Adele wears a Russian-style fur hat. and wears her pregnancy well, in East Sussex. British songbird Adele has come out of hiding to show she’s “Rolling in the Deep” of her pregnancy. The 24-year-old Grammy-winning performer, set to give birth any day now, showed off her baby bump while on a stroll Thursday in the English seaside town of Hove. Wearing baggy black pants, a loose-fitting sweater, a Russian-style fur hat and Converse sneakers, Adele went to check out her newly refurbished home in the East Sussex town. With her was partner Simon Konecki, 36, and their dachshund, Louie. Adele announced her impending motherhood in June, when she was already well into her pregnancy and has kept a low profile ever since. 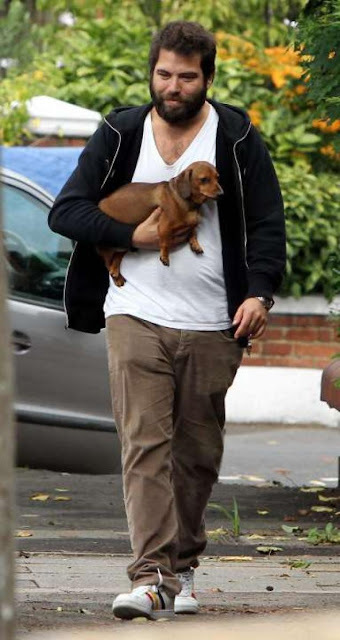 With her was partner Simon Konecki, 36, and their dachshund, Louie. “I’m delighted to announce that Simon and I are expecting our first child together,” she wrote on her website at the time.